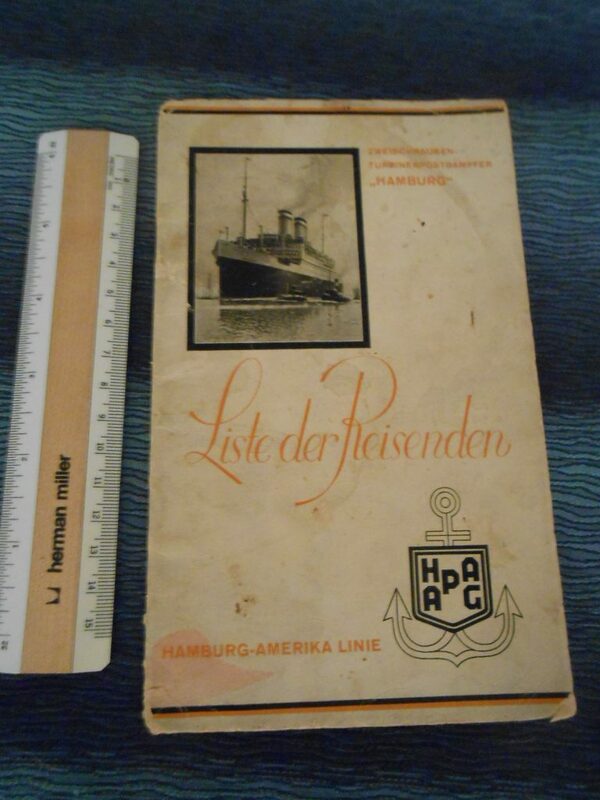 Neat little info booklet for the Hamburg… one of the post WW1 sisters that rebuilt HAPAG services. 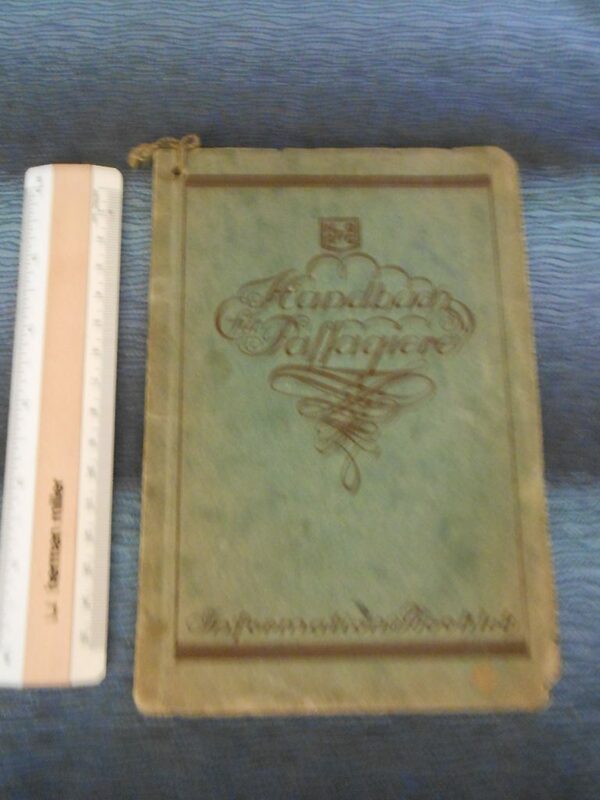 About 45 pages .. the contents are written in both German and English. 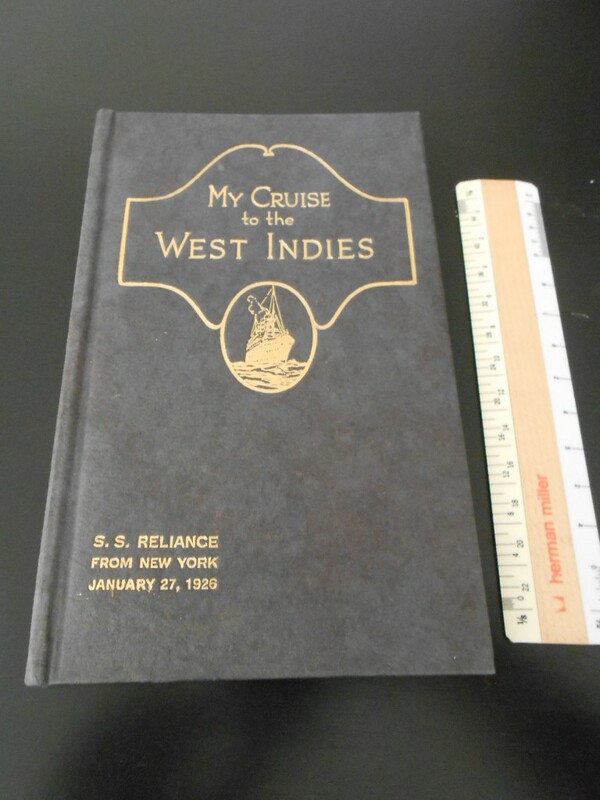 Includes 2 small inserts relating to the voyage on the ship. The cover is a little discolored .. but ok shape! 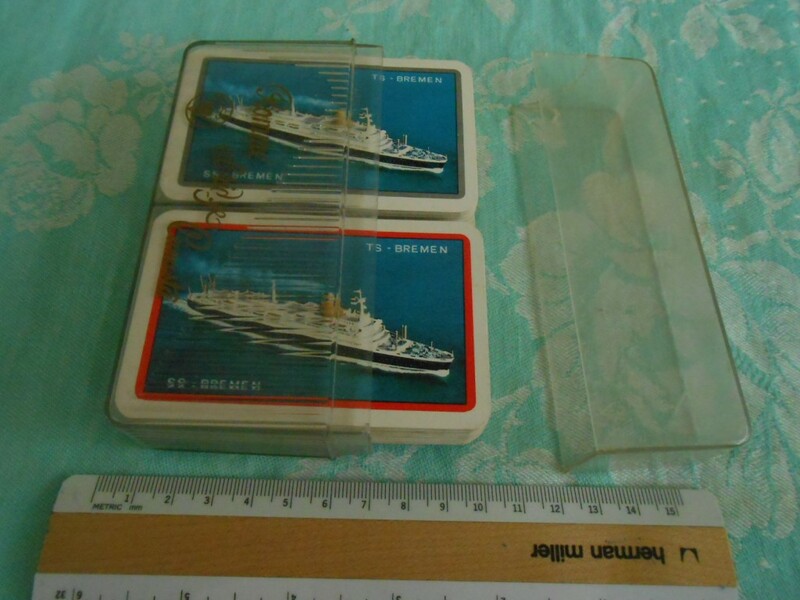 NDL: TS Bremen Double set of playing cards. TS Bremen dual set of playing cards. These were probably purchased on board. The cards are in great condition one set with a red boarder .. the other with gray. The case is a little cracked on one side … all else is wonderful! 3 jokers per color set. 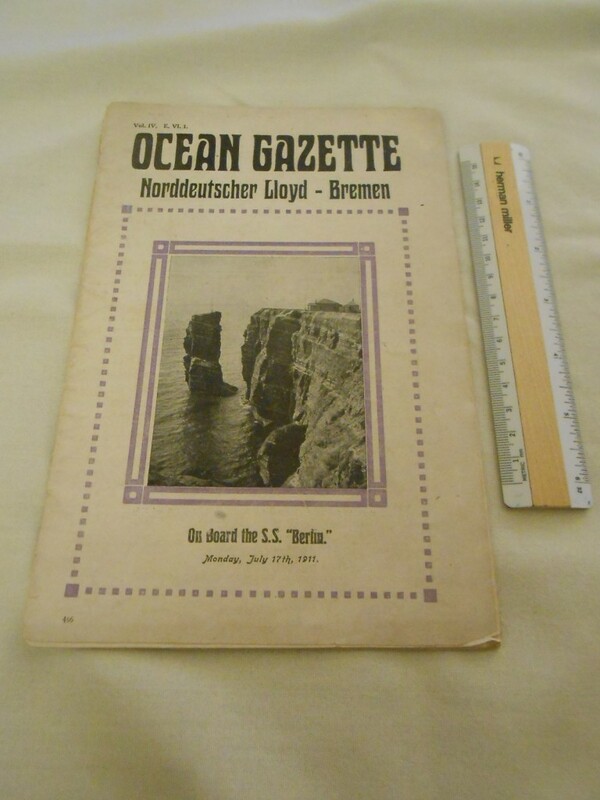 Interesting Ocean Gazette from onboard the SS Berlin July 17th, 1911.
filled with general articles and vintage ads including other NDL services and cruises. The front cover is separated from the rest of the booklet. 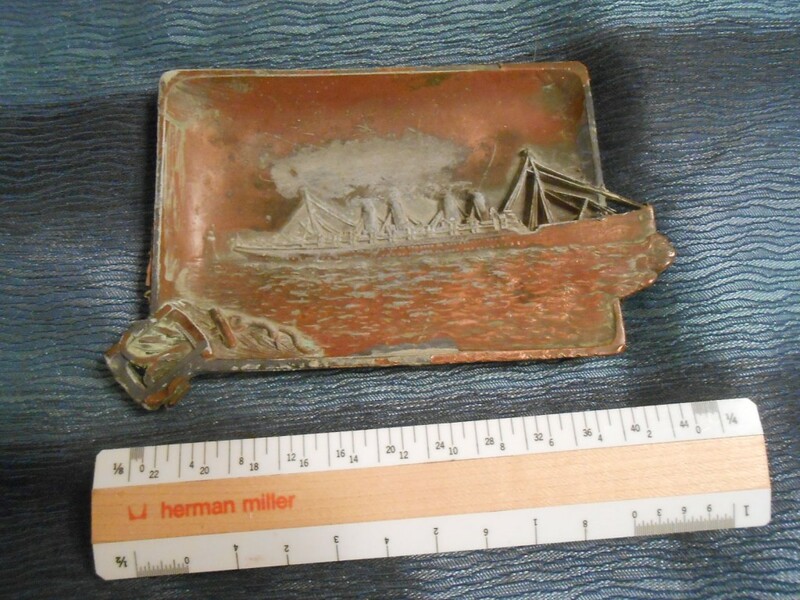 Interesting heavy metal ashtray with a profile impression of one of the Early German 4 stackers. This originally had a copper like finish coating that has mostly peeled off over time .. I bet this could be recoated though. Certainly interesting … I wonder what secrets it’s history holds?. Lovely crackle glaze trinket box for NDL’s last Flagship Bremen. 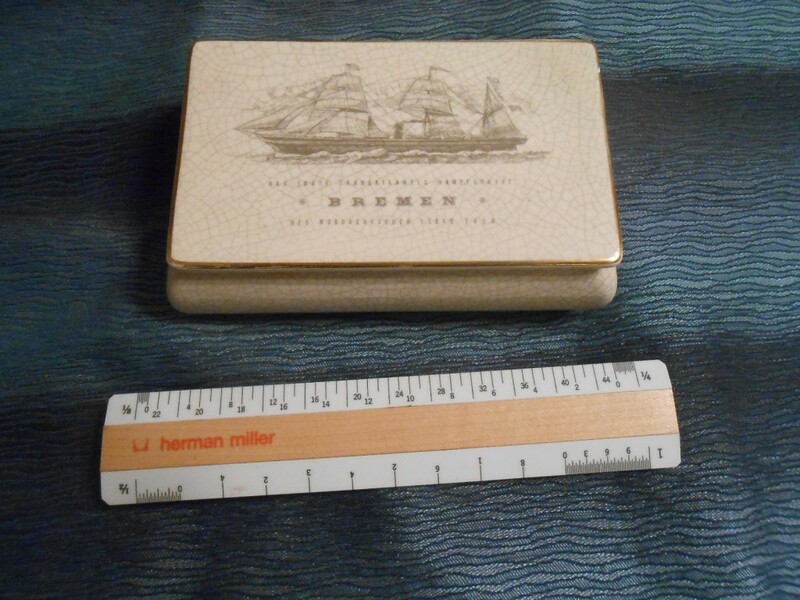 The box is perfect for coins and or maybe small cosmetics (my nanny would have used it for beauty powder). The cover boasts a great profile of NDL’s First Bremen on the outside .. and the Bremen V on the inside. Excellent condition. 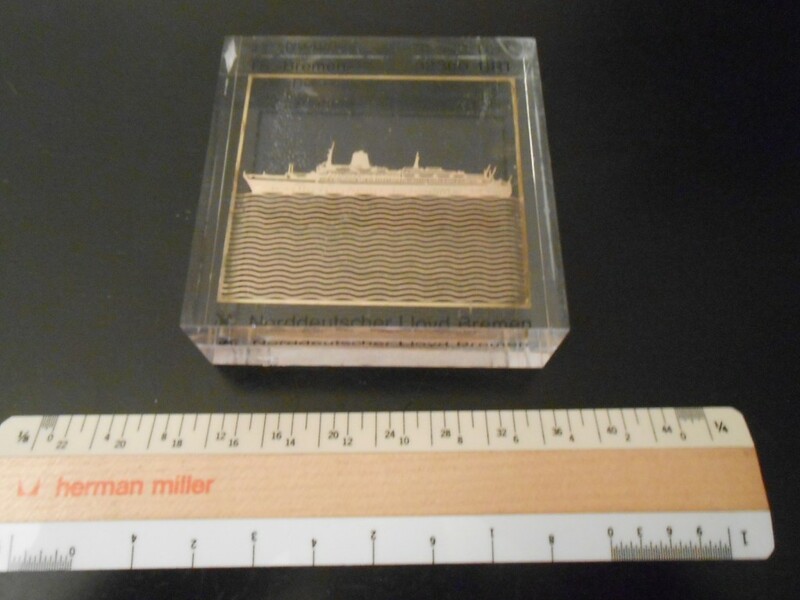 Really cool souvenir Cig Cutter from the Cleveland. Very well done .. the needle on the telegraph even moves when you “slice” thorough your cancer ridden tobacco flavored death stick (I’m a non-smoker). 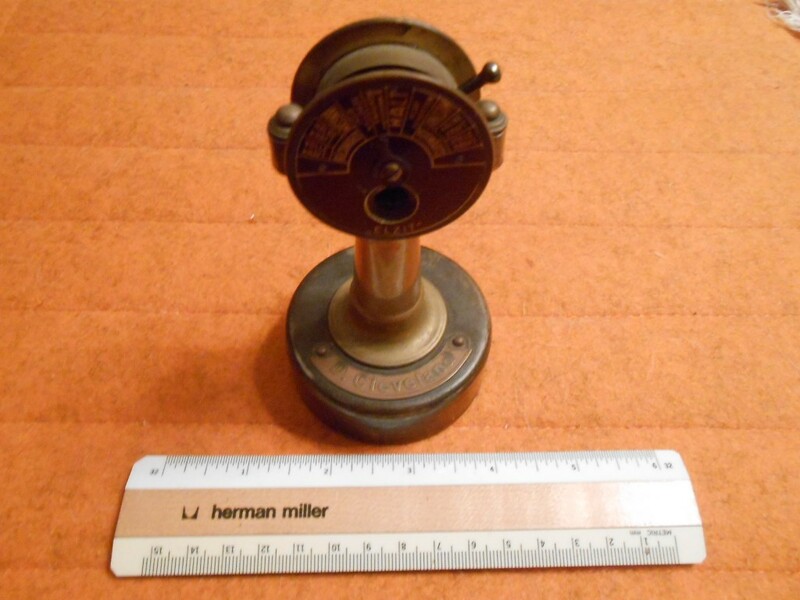 The lettering on the telegraph is in German of course .. The Cleveland when launched was one of the largest liners in the world. 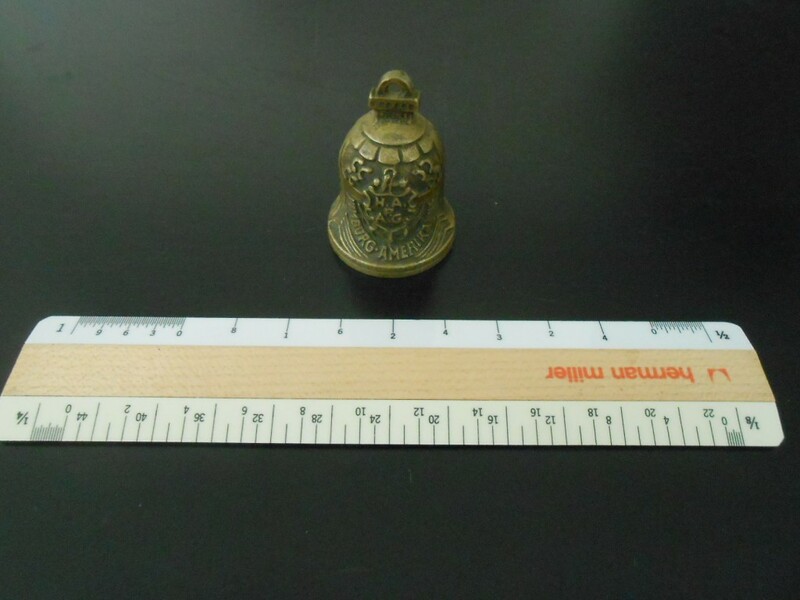 Uncommon and unusual item. Mostly Brass construction …needs polishing. 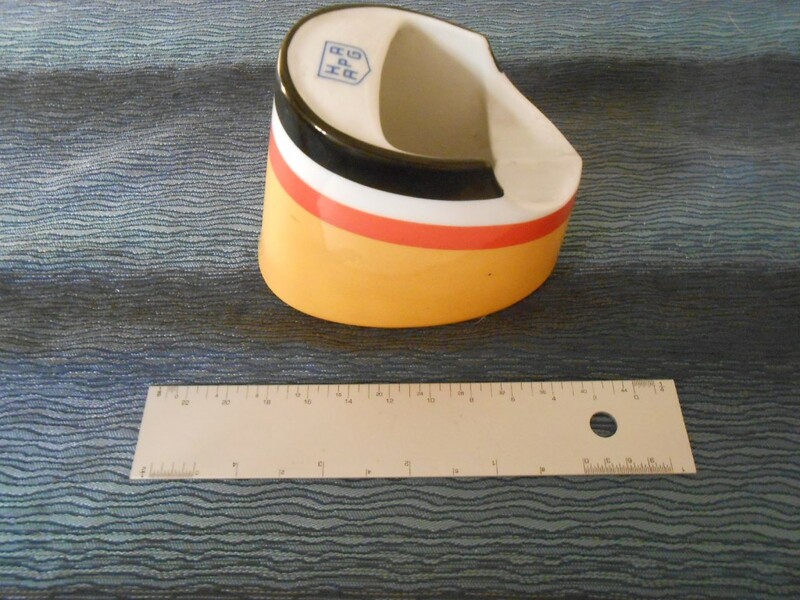 A very popular souvenir in the later 60’s and 70’sa re there funnel ashtrays .. This one is for HAPAG done in their unmistakable colors. Impress your German Liner smoking companions. Excellent condition. 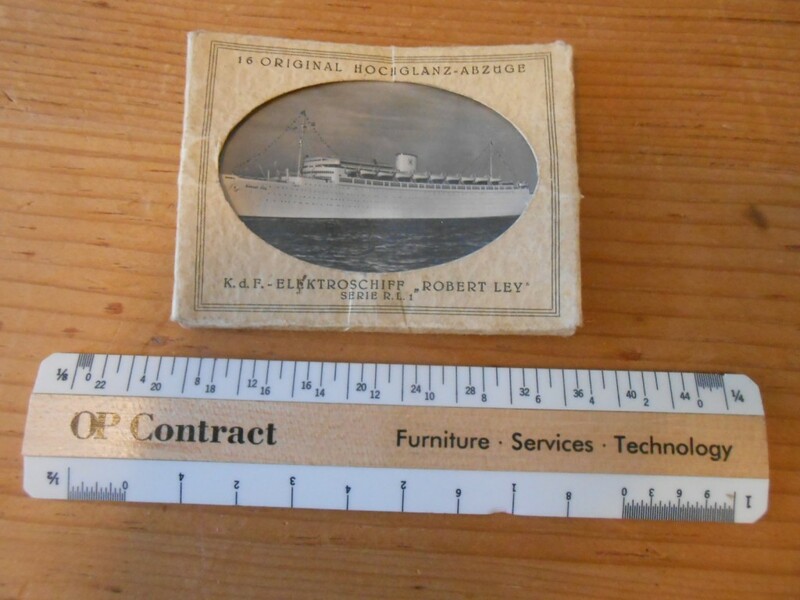 Great little pin dish for the Last NGL flagship Liner. 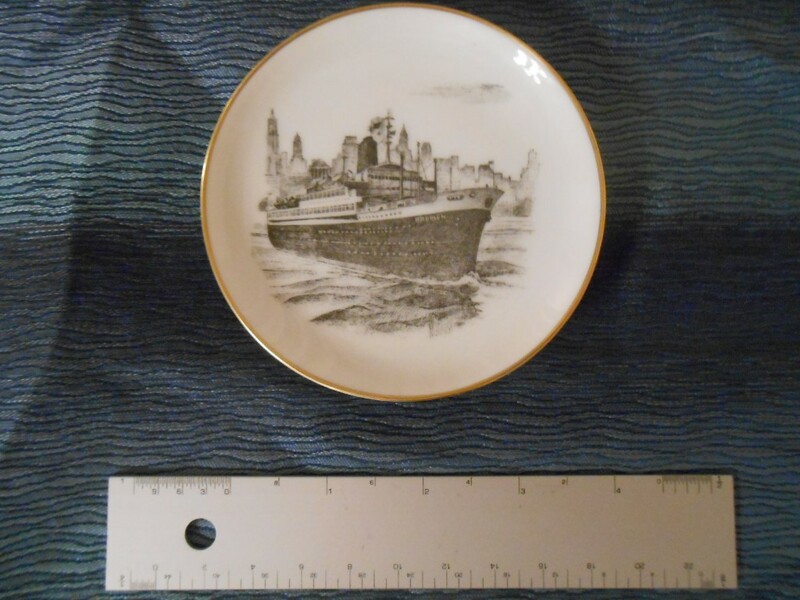 I just love “etching” like portrait of the ship leaving NYC. Gold trimmed and in Excellent condition. NGL anchor and key house flag on the back side. Great little souvenir item for the lovely last flagship. The ship is shown in gold. A few light scratches. 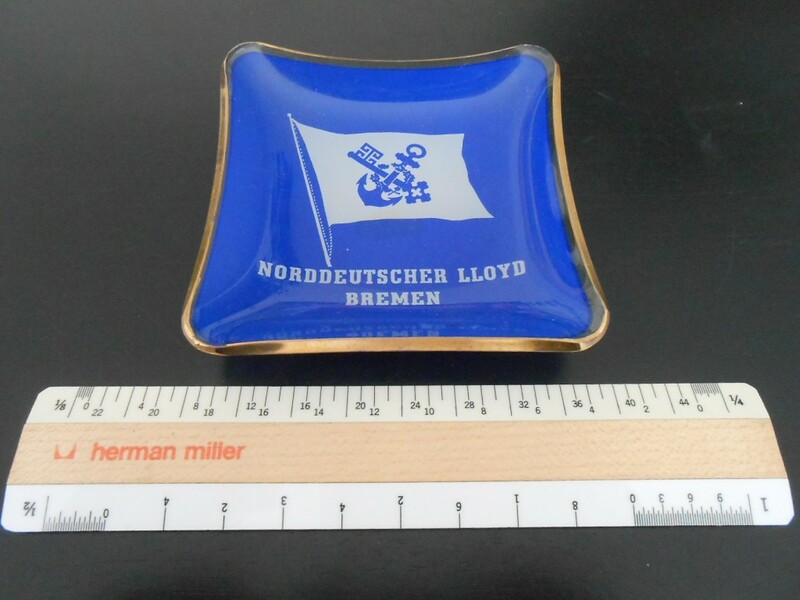 Lovely cobalt blue ash/pin tray from one of the NGL ships giftshop. Lovely Anchor and Key symbol … gold trimmed! excellent condition. 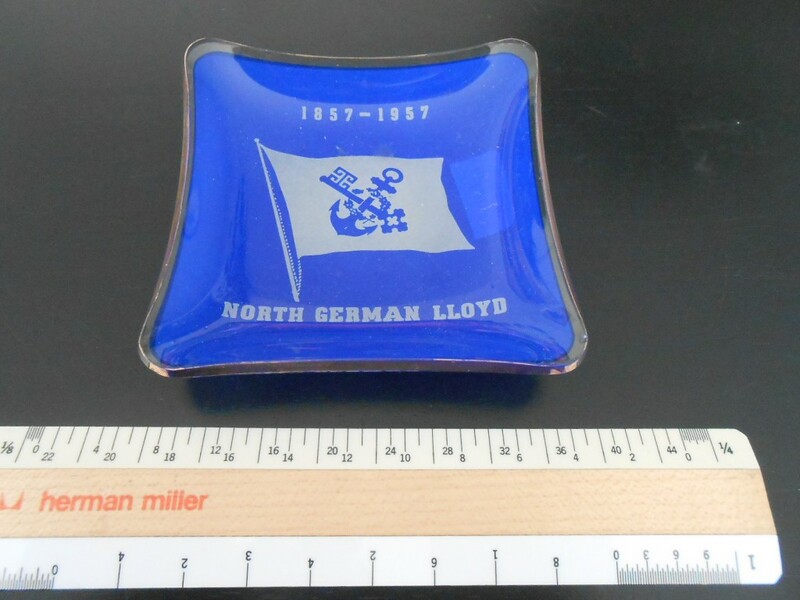 Lovely cobalt blue ash/pin tray for the 100 year anniversary of NGL Services.. 1857-1957. 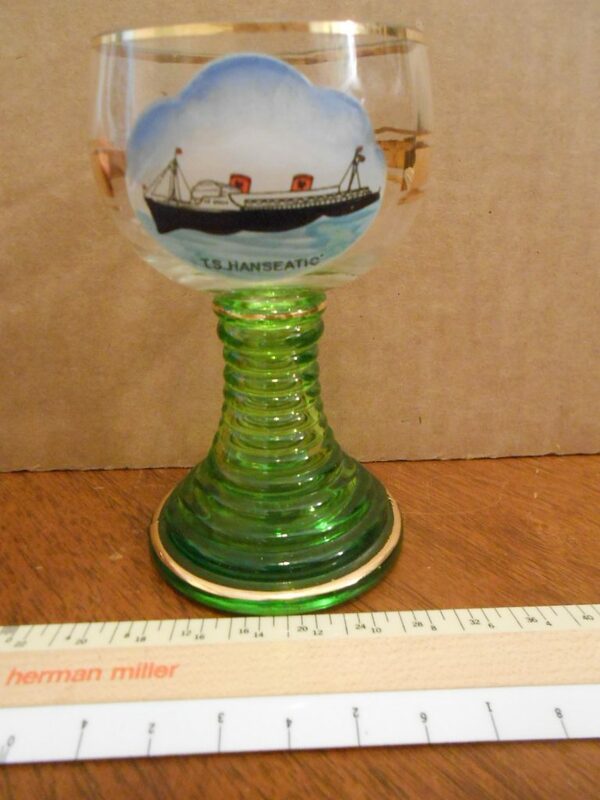 Great brass bell for the little Hapag Hamburg. 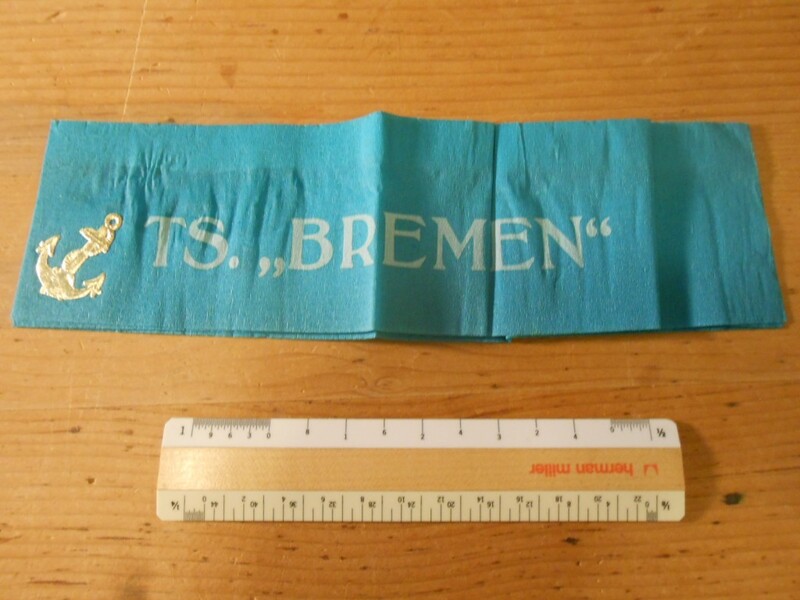 Lovely souvenir item for the little 1920’s built German lady. Excellent shape and rings like a charm! 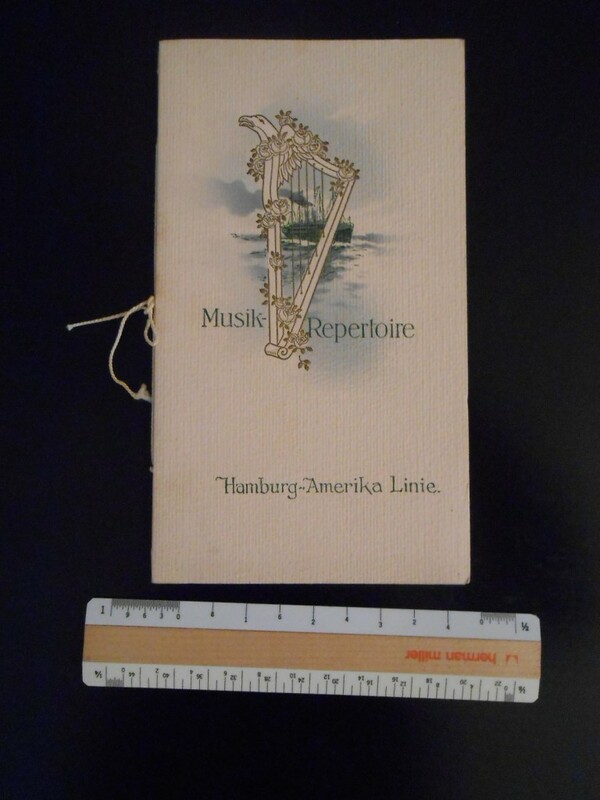 HAPAG: Victoria Luise Misic Program. 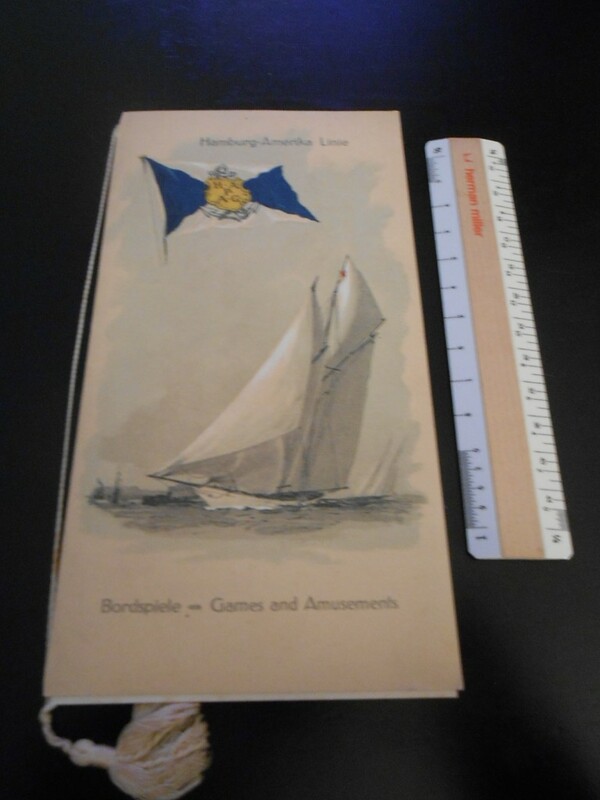 HAPAG: Games and Amusements on the Victoria Luise June 16th 1913. Outstanding sports and amusement card for the luxury cruiser Victoria Luise. She was once HAPAG’s fastest liner … but was so problematic she was converted to cruising. Heavy card stock and fancy ribbon. Activities from several rounds of potato races to “Chalking the Pigs eye”. great shape with some spots on the inside. 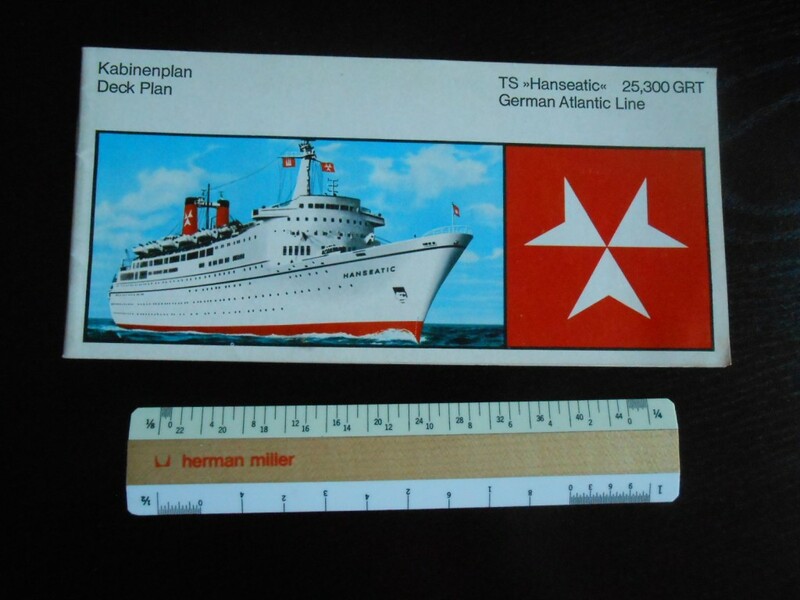 Terrific full color deck plan booklet for the cute little Hanseatic. 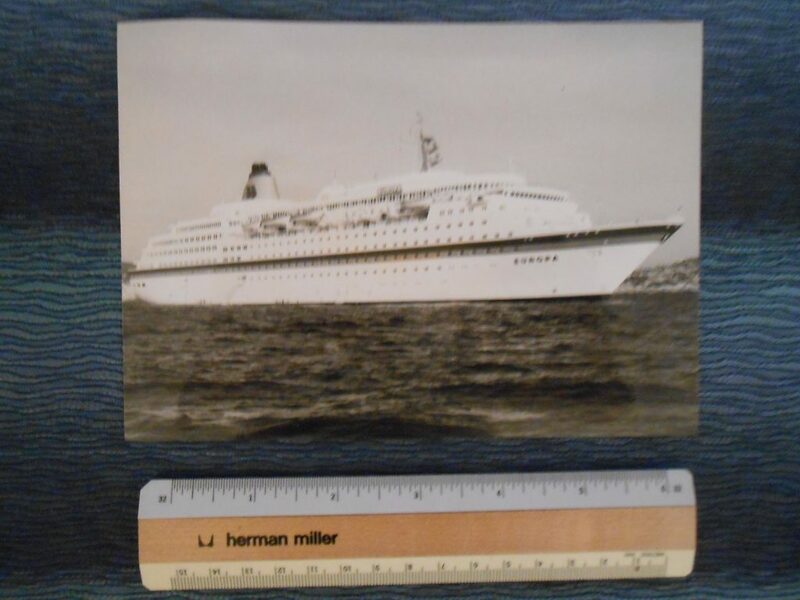 She started life as Zim Lines Shalom… but was sold odd to the Germans after only a few years of Transatlantic service. 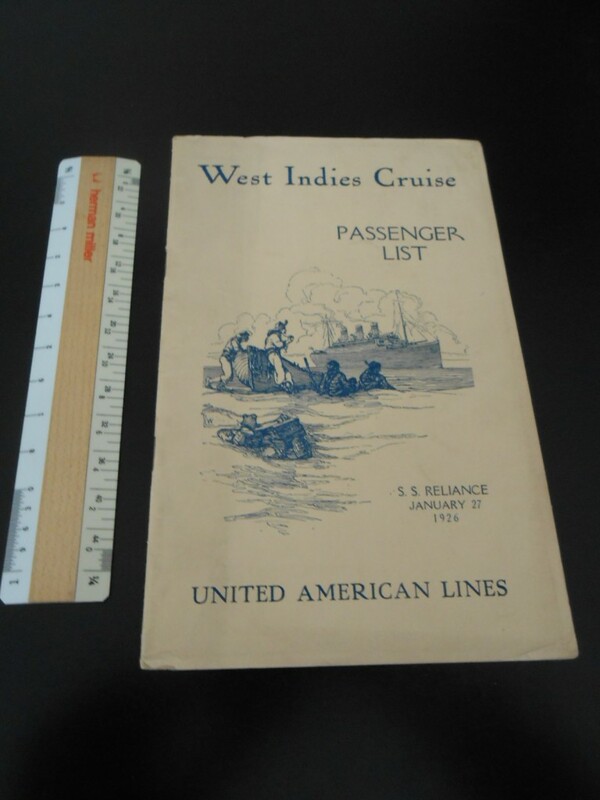 the plan is printed on glossy paper and includes color photos of people enjoying various rooms and activities onboard. Excellent like new condition! 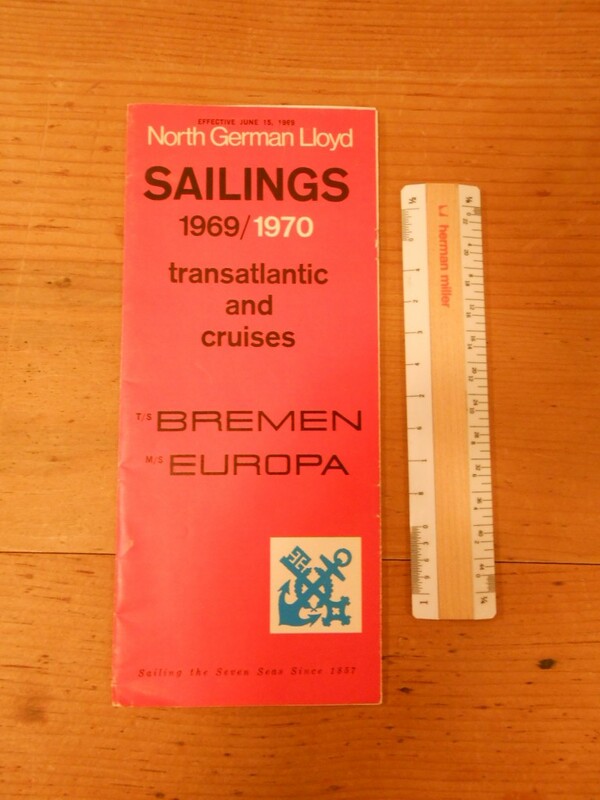 Nice litle sailing schedule folter for the 2 German passenger ships. 2 of the 6 pages are dedicated to the individual ships (which is unusual for a sailings foldout) while 4 remaining pages are schedule and general info. Both ships would soon be sold to other owners. Once the French Pasteur, NDL’s last Bremen was extensively rebuilt and brought into German service in 1959. This is a cute little crepe paper party hat form one of her voyages .. in great shape! Pretty rare 16 photo packet set for the KdF cruiser Robert Ley. She was the last ship built for Hitler’s “strength through Joy” program. There are 16 photos … mostly interiors (the pool is amazing) . All are numbered … which correspond to a little descriptive list that is included. 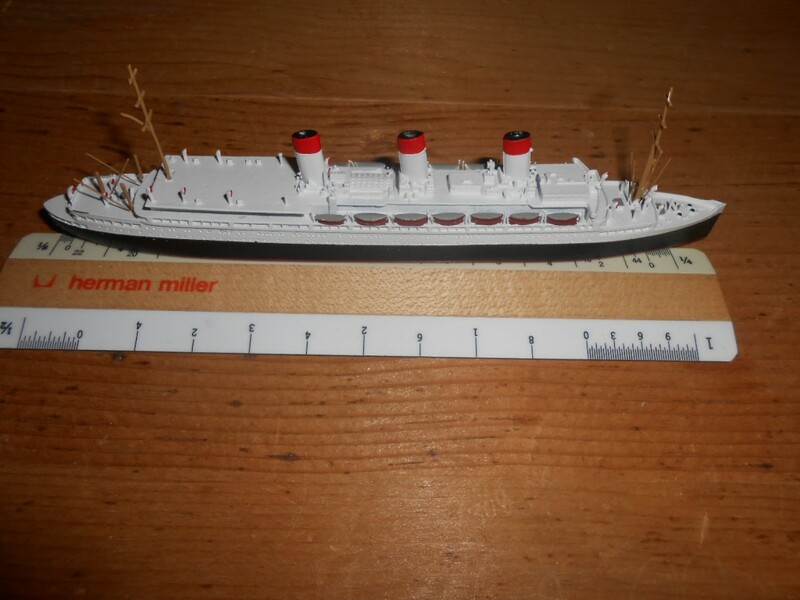 All are in excellent condition except picture 10 (lifeboats) which has one corner clipped. You won’t be disappointed! 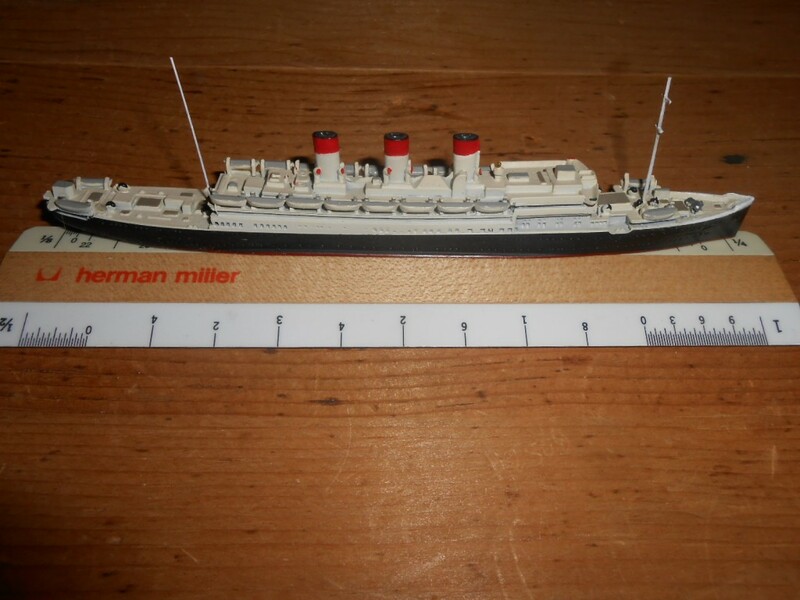 Wonderful and minutely detailed Mercator Model of Germany’s leading lady to South America … the Cap Arcona. She was called the “Queen of the South Seas” and offered the finest passage from Germany to South American. Taken over by the German navy in WW2 she was used to house prisoners and refugees. Unfortunately, just a few days before Germany surrendered, she was bombed and almost 5000 souls lost their lives.